This was only my second marathon this year. It’s an abnormal year for me. Haha! It was a very abnormal year, to say the least. But I always have this race on the calendar each year, so I knew I had to run it no matter what. This was my 9th CIM, and I am not letting anything break my streak. This year was tough. Mentally, emotionally, physically. My training had been so good before the Iceland marathon in August, but then some life changes altered my training plan and I didn’t run for 44 days. Then one day, I just ran. I knew I needed to get my mind back into this. I managed to get enough long runs and up to 20 miles, so I felt okay going into this marathon. Just okay. My pre-race meal was a burrito bowl from Chipotle with chips, salsa and guacamole. This is not my normal meal. I ALWAYS eat pizza. But it was what I did this year. Everything seemed out of place and not normal. I didn’t have my partner anymore to help me the night before. I didn’t have my partner to drive me to the start or pick me up at the finish. Things just were different, but I had to do the best I could. I even wore leggings(!) for the first time ever in a race. I had lost probably 5 pounds, maybe more, due to stress, and I knew I needed the extra layer of warmth. I got a ride with Jen. Her husband Andy took us to the other side of the start and we got to sit in a warm car for a while. I ate two KIND bars, half a banana, a chia surge gel, and barely any water. That was the best I could do. And it was a really chilly morning. I also started with Jen. I honestly had no idea of what I was going to run or what kind of time I was going to be able to pull off. But the night before I just thought to myself that maybe I could pull off a 3:45 finish time. So, off we went! We started at a really great, relaxed pace. But I was able to catch the 3:43 pacer and I stayed with the group for a long time. I was ahead of Jen, but I didn’t want to ditch her. I was looking back for her for a while. But then I kind of took off. At some point, I was even ahead of the 3:43 pacer for several miles…probably around a 3:40 pace. I really felt pretty good. About mile 22 was when I fell behind a bit but I was still on par for a 3:43. I was just in a zone, but I saw friends along the course. This year, I didn’t stop at Bonn Lair, a tradition. I did see a few friends there and waved as I passed by. My ex wasn’t there. It was just a different experience this year, after 8 CIM races with him. I kept going and just stayed as focused as I could, knowing I could get in under the 3:45 possibly. The last couple miles were tough. I didn’t want to stop, and I just wanted to get to that finish line. A lot of people were walking around me. I had to stay motivated somehow and I just kept saying “I’ve got this”. The last mile I just got the energy I needed and rounded the last two corners and finished with a 3:44:23! I honestly don’t know how that happened. When I stopped, my legs were actually shaking. That had never happened to me before. My body was not in the best shape for this. I pushed it. My body took a beating with sub-par training. If my training had been what it was over the summer, I know I could have gotten a 3:35-3:38, but that wasn’t going to happen for this race. Stress can really change things for your body. “perfect” race, given my lack of training. 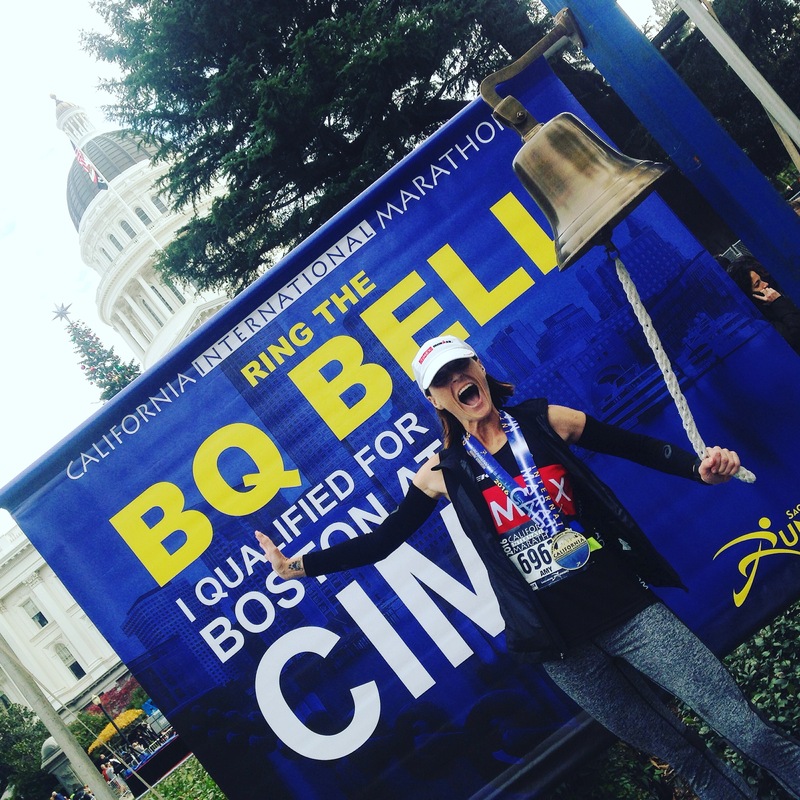 After the race, Jen went with me to ring the BQ bell. This was my 3rd BQ but my first time ringing the bell. It was pretty exciting! And there were quite a few other runners ringing that bell as well! After I let this soak in, I realized this accomplishment was what I needed this year. I needed this to end my year in a positive and amazing way. It was an incredibly tough year for me and I had been so focused on other things that were so consuming. I wasn’t taking care of myself and doing things for ME. This is what made me feel like ME again! I am a runner – it is one of my most favorite hobbies and things I love. I am many other things, but running is what I enjoy and have a great passion for. 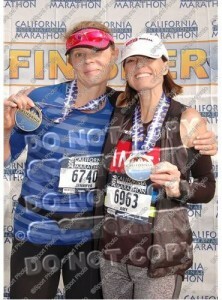 So, I am grateful I am healthy and can run marathons and inspire other people.